Savvy Brew Crew member, Éva Nagy, first visited Kichesippi Beer when she was a ‘student of beer’ during the time she enrolled in The Beer Course (part of Algonquin College’s Sommelier program). Part of their ‘field trip’ was a brewery tour that brought all her learned textbox theory bursting to life. “Quite a few new beers have been introduced since that time & I must taste them all!”, she notes with glee & a laugh. It all began in a non-descript warehouse that housed the former Heritage Brewing Company. At first, Kichesippi contracted all of their brewing to Heritage (they just brewed Natural Blonde at that time). When Heritage’s owners were ready to retire, Paul Meek stepped in to take over the brewery & made it the home for Kichesippi Beer Company. Paul remarks how easy all of this has come together for him since he started a mere five years ago. Paul, had worked with larger breweries as well as small importers. Being in ‘the beer biz’ since his university days, it became clear to him that in Ottawa there was a desire for imported craft beer. Peculiarly, it was a strong English ale from the Halifax-based Granite Brewery that was his inspiration for his own brewery. He had the confidence & his family’s support to forge out on his own & make a go of making local craft beer. Now, Paul (and his family) don’t have the time to look back! The brewery is constantly growing & receiving accolades for their business and their beers. For Paul, it’s all about family. The key motivation for their family-owned brewery is his wife Kelly & teenage son Alexander. In fact, it is Alexander who designs the bottle caps & gets involved in being one of the lead ‘developers’ to create the recipe for Harvey & Vern’s Old Fashioned Sodas (cream soda, root beer & ginger beer). It has become another success story. Paul’s focus is to bring balance with flavours & aromas to each of his beer styles. He receives his supply of Polaris hops directly from the farmers in Germany. He prides himself on being their largest contractor. It is these hops that bring that refreshing bitterness to Wuchak Polaris (at 61 IBUs). Paul has seen tremendous growth in the Ottawa market. Not so long ago, there were only two breweries in the city: Kichesippi & Clocktower Brew Pub. Paul commends his fellow craft brewers for being courageous & trying new things. Now Ottawa boasts a growing number of craft breweries. “We are the biggest of smalls in the city”, explains Paul, meaning that they are a fully functioning facility including stills, bottling & canning lines. This comes with a steep learning curve for supplies needed for making beer from grain to glass. “We even have a forklift”, he laughs. (Apparently that is an industry sign of size!) 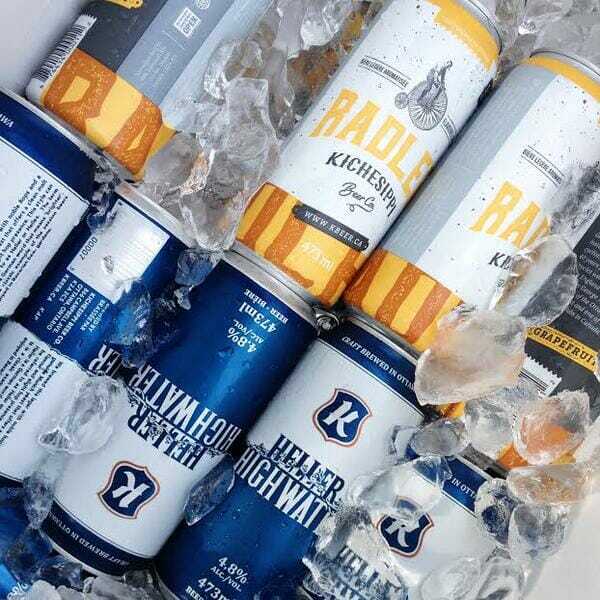 They’re the first in Eastern Ontario to package their beer – Heller Highwater – in a can. Kichesippi has a friendly atmosphere & loyal customer following. One day, a regular customer & former security professional, heard Paul in discussion with staff about a drink called ‘lemon squash’. Well didn’t this customer return from his trip to Australia & drop by the brewery with a bottle of lemon squash in hand for Paul & his crew. WOW! Once a month, Kichesippi is shut down for Pizza Friday. Family & brewery staff can relax & enjoy some ‘zas with beer … and not their own beer. Paul wants his team to enjoy each other’s company along with spending time learning about the local craft beer world – together. We raise a glass to the Kichesippi team! Savvy Hip Hops is Ontario’s first craft beer of the month club. To further your enjoyment of Ontario’s best craft beers, each month the Savvy Brew Crew compiles a ‘mini-magazine’ to give you the inside scoop on the brewery, the brewmaster & of course the beers! It’s just one of the benefits of being part of this hopping club. Sign up today for more beer knowledge. Cheers! Originally written for Savvy Hip Hops subscribers by Eva Nagy of Savvy Company’s Brew Crew.